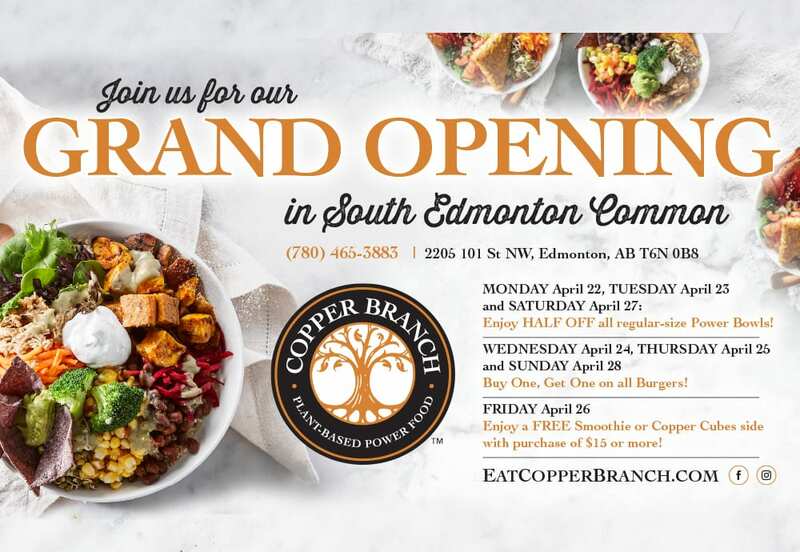 Copper Branch is Edmonton’s newest affordable plant-based restaurant, conveniently located right here in South Edmonton Common. Enjoy grand opening specials between Monday, April 22nd through to Saturday, April 27th! Plus, enter for a chance to win 1 of 2 $100 gift cards to Copper Branch! Copper Branch is located at 2205 101 St NW (South Edmonton Common). Visit our Facebook page to enter the contest. For contest rules, see below. The contest runs from Monday, April 15 to Tuesday, April 23rd. For an additional entry, the contestant can share the Facebook contest post to their Facebook profile. The shared Facebook contest post MUST be set to public. Two winners will be chosen at random on Tuesday, April 23rd at 11AM. The winners will be announced and tagged on the Facebook contest post. Each winner will have until Friday, April 22nd (11AM MST) to accept their prize by replying to the announcement of their win. If the winner does not accept their prize within the specified time frame, the winner automatically forfeits the prize and a new winner will be randomly selected and contacted at South Edmonton Common’s discretion. The winner must be able to pick up their prize within 30 days of accepting their prize at the designated pick-up location in Copper Branch South Edmonton Common e at the time and date specified by South Edmonton Common unless otherwise stated by South Edmonton Common and/or its related affiliates. Contestants cannot win both gift cards. The prizes are redeemable only at the South Edmonton Common Copper Branch location. By entering the contest, you accept the rules set out above, which are subject to change without notice and automatically releases South Edmonton Common and any affiliated parties from any liability in connection with the Contest. No purchase necessary. Internet access and a public Facebook account is required. No other means of submission will be accepted. DISCLAIMER: This giveaway is no way sponsored, endorsed, administered by or associated with Facebook.